W. B. Handmade Freehandpfeifen! W. B. As the first I would like them on my provided myself homepage to present. I place since my 19. Lebensjahr pipes in pure manual work ago. I have never with someone learned, how one manufactures such a thing, but to me everything taught. I obtained the best results, if I were with somewhat not content even and changed in such a way it then, as it was best for me. It turned out then that these improvements met with large approval also with other pipe smokers. Thus hold I it also today still, occasionally place I a whistle for me around the quality offered by me to examine ago. That is for me the best kind to see my customers good quality to receive. Since I am by occupation machine-builder, I had a problem with the activities relating to crafts never. Have they questions or problems around the pipe to use approximately them mine E-Mail Button. SMOKER`S CLUB expenditure 3/1998, the magazine for Tabakgeniesser. Admits from television, radio and press, the Pfeifenmacher from Besse! So far to me, everything over pipes for a riser , pipes extra , trying pipes and my Freehandpfeifen on the following pages. But you can get more with me still, see you in the text standing the down left, as well as the offers at the end of this side. pipes of different companies and pipe bags and tobacco bags at favourable prices on. It concerns here sorts it today partly already any longer does not give. To the largest part the offers are distinguished still in DM, to the sales are converted all prices to euro. Are not there these tobaccos by the substantial tax increases of the last time affected are it a favorable purchase. There these tobaccos in unlimited quantity are missing are indicated in parentheses the number. To the order they go please on my E-Mail address present at the side. A new offer is decoration from wood, it concerns here rings out of Bruyereholz, olive wood and gold rain wood. All pipes offered on my sides can buy it, which uses it to them if I pipes shows those is already sold! Here is my foreign exchange: of the producer favorably directly to the consumer. Even if in publications for pipe smokers that is not stated occasionally the consultation in the InterNet were optimal leaves in such a way I it mine customers to judge nevertheless who it better advises, the manufacturer of the whistles, that smoke even since over 40 years pipes, or a salesman or a shop assistant those not yet times pipe to possibly smoke or in extreme cases even nonsmokers are. Also I have particularly for hunters or at the hunt and its Trophaeen interested customer pipes manufactured in their execution probably unique am. But it remained not with pipes but it gives also different interesting pieces there. Also pipe and tobacconists know at any time with me a buying. Please you inquire under indication of the business address after the discounts valid for retailers. For it or your pipe friends. to insert as left to my E-Mail address. I opened some years ago a small shop, which is attached to my workshop. Here they can examine pipes of all preisklassen. 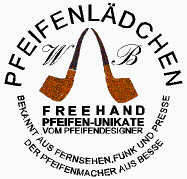 I offer in addition, failed handmade Pfeifenstopfer and rich accessories for pipe smokers to them. Beside many tobacco places of considerable pipe tobacco manufacturers there is its own own brand with the name "pipe dream" (description of the tobacco under Tipps) . Of course I dispatch also pipes and my own brand of the tobacco at customer, who is too far the way to me. It settled in myworks instead of also all resultingRepair. Even to the hobby Pfeifenmacher I thought; they can get nearly everything with me, which they need for manufacturing a pipe at material. I legend therefore < nearly > everything, because the necessary fate relating to crafts must her already have. My shop is opened however only from Tuesday to Friday of 16 to 18 o'clock and Saturday of 10 to 12,30 o'clock. In addition, with telephone arrangement other attendance times are possible. After my personal, now the conception of my pipes and the material. ONLY THE BEST IS STRAIGHT LINE PROPERTY ENOUGH! Since I furnished myself since beginning of my activity as a pipe farmer its own drying soil for Bruyereholz with a friendly dealer in French law, the question about first-class Bruyere material is not responsible only for me, but I have it stop on my own drying soil. All pipes manufactured in my workshop are from Plateaux Ebauchons. For my exclusive Freehandpfeifen I use Bruyereholz which I before 30jahren stored. One notices this good, at air with changing temperatures, taken place drying process at the weight of my pipes, with me is immediately also large pipes true lightwights. To provide to an exclusive Freehand Unikat pipes comes it not rarely before which I up to 50 Ebauchons grind, in order that, my conception for this pipe correspond to find. After pre and finished cross section from the free hand at a rotary grinding wheel and the further finishing with ever finer sandpaper each pipe with a light-genuine pickle to a responding color and a beautiful contrast brought. I make the locking polish with special waxes, with which the wood receives a good breathing activity and nevertheless a long lasting seidigen gloss. My handcut mouthpieces for the Freehandpfeifen finished I from acryl disk commodity individually for each pipe on. But these mouthpieces have still another characteristic. By many pipemakers the relationship of the drilling for the tobacco area to the drilling of the zugkanals is always said must fit to each other. That is also correctly like that, only which has it for a use if in the mouthpiece the drillings is too close! With my Freehandpfeifen the cross section is identical in the mouthpiece up to the end to the course drilling. Required naturally an enormous expenditure of manual work and precision however pays itself out by good course characteristics and a outstanding smoke pleasure. If it requires the Design in my opinion or is intermediate rings in all variations possible, from Sterlingsilber 925 over gold 585er, acryl provokes veined in many variations, to polyesters. Acryl of mouthpieces finished I in many colors, in addition, Cumberland of mouthpieces of ebonite (ebonite is called by some manufacturers also Parakautschuk) with me from a bar the round material to be made are possible. In addition, they can get black mouthpieces from ebonite. Here now an overview of my pipe offer. I make handmade pipes from Bruyereholz in different qualities in my workshop. All pipes in the different preisklassen have one together, them are light-genuinly pickled and only with waxes polished all. All tobacco areas are free from any "a smoke pastes". They can examine the intact and well gemaserte inner wall with the purchase of the pipe. Their own "a smoke paste" you know then with your own tobacco through smoke yourselves to bring in, which is by the way the best "a smoke paste" it gives. If you should such a thing absolutely need however, it is not a problem the pipe after the purchase thereby to "preparing"
Next pipes out up to 30 years at air deposited Bruyereholz. It concerns with these pipe Unikate it so only once gives. Naturally from the free hand at the disk polished. They can give with me in addition, Freehand Unikate after their conceptions and sketches in order, if it is technically possible becomes them made. But they can do itself also from my rich offer on first-class gemaserten and in different sizes available pipes a fitting them to select. These pipes are mostly lightorange pickled. By special, complex wax polishes they hold for a very long time their outstanding gloss. Under the link workshop I offer to you of picture and writing a small view of my workshop to and by writing and pictures supported can her there the "birth" of a pipe with experience. Under the link Tipps and cheat tries I to the beginner to give in addition, the advanced pipe smoker assistance for all arising problems approximately around the pipe smoking. Under the link you an offer of pipes from 8 expects trying pipes years deposited Bruyereholz. These pipes are ideal for trying out around the qualities of my pipes to recognize thereby one a favorable comparison which one with a Freehand at smoke quality expected. They should have questions or suggestions, or want them only one comment to my sides to deliver like that are cordially welcome them with a Mail to me. I offer plateau Ebauchons also pre-drilled under my side "hobby"
with acryl mouthpieces in some color variations with teflon taps on. Attention collecting tank and beginners!!! 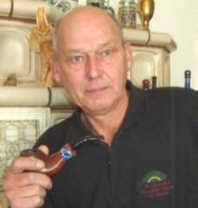 A further offer are Second hand (Estate Pipes) pipes. What is that? It concerns here pipes already smoked of me was again regenerated. A part of the carbon film in the tobacco area left, like that that the pipes with the purchase is already in-smoked. The mouthpieces and the head were again polished after a thorough cleaning. Partial Unikate from my workshop concerns with the offer not mass-produced goods but it is. Here you have the possibility by one click yourselves also different sides of me to regard. Since installation of the counter to 01.09.2004 are you the visitor NR.